On a lighter note...here is a preview of the next Loose Feather pattern....not all of it....but enough to give you an idea of what is to come. I'm in a pink mode. I just can't get enough of these linens with a pink tinge. I can't explain why these shades seem to call to me. This linen is by Weeks Dye Works....it's 30ct. Baby's Breath. The last Loose Feather project I designed was on pink linen too....Don't you wonder why you are drawn to a certain color and then a year later don't give it a second glance? Want to see something even better? I ran into Sharyn Rittgers at Two the Point last week. (My local cross stitch / needlepoint shop.) She sent the above picture to me. 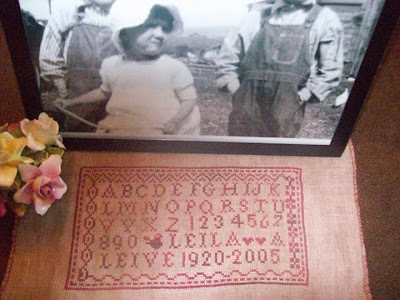 "Here's a picture of my sampler........I dedicated it to my mother, Leila (pronounced Lee ila). That's the first picture taken of my mother when she was around 3. She's with her two older brothers. She was born in Montana where my grandparents had gone to homestead. In a few years they moved back to KS as my grandpa was able to settle on the family farm. My mother loved birds so it seemed appropriate to stitch one by her name. The two hearts are for my older sister and me." 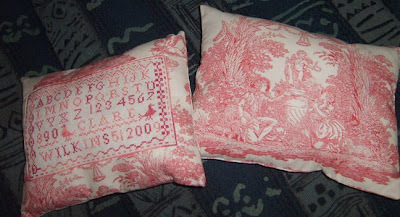 "Here are pictures of my PLR pillows, which a friend made up for me. The front is my original one and the back is of the 2nd one I made for an exchange. It was great to use my toile de jouy fabric for something special and I love how they turned out!" 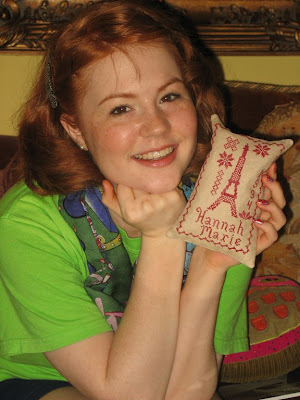 "When I read your blog and saw the cross stitch offering with the Eiffel Tower, I knew I had to make it for my daughter Hannah's 15th birthday. She loves all things French and is taking Honors French in school. She hopes to visit Paris next summer with her class...but for now, she was thrilled with her French cross stitch that is filled with crushed walnuts and lavender...ooohlala!" Teresa, Clare and Sharyn... you are right there with me! We are now official pink sisters. Hi Alma! First of all, the new Loose Feather is so pretty! I'm definitely going to be looking forward to it's release. I used to have the same problem with the thread being uneven. The only thing that seems to help me is using John James #26 needles. They have to be the new needles with the solid yellow background (don't ask me why). Ever since I've used those needles I haven't had a problem! Good luck!! I was just thinking about posting on the same issue with my threads! 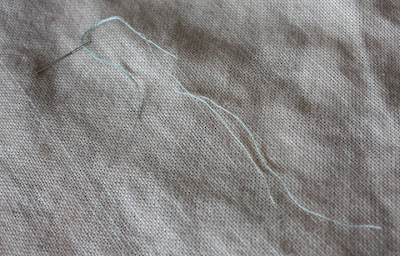 I almost always end up with 1 thread about 1/2 inch shorter than the other and it really annoys me because I am a careful stitcher and kind of obsessed about railroading the threads. I recently purchased some John James needles, so I am going to give them a try to see if it works. Your new Loose Feather is lovely. I am looking forward to it's release. Isn't that problem a pain. I have that as well, thats why I like stitching on 40ct or over 1 with 1 strand. I live South of the Equator in Australia so that idea doesn't seem to work. Sounds a bit like the idea of "which way the water goes down the plug hole - clockwise or anticlockwise" lol. Will have to keep a look out for the John James needles. Love exploring your blog, its beautiful. - Sandra. Hi Alma, I run my thread across beeswax before stitching and once threaded. this seems to help the tension problem. Are you using two cut threads or a single thread double up, it using a single thread doubled I think the tension problem is occuring because you are pullin one thread with the grain of the thread and the other thread aginest the grain. If that makes sense. Hi Alma, I too have that trouble, I thought it was just my lack of stitching knowledge. We don't have John James needles down here South of the Equator (Australia) so I shall have to look at experimenting with needles. I love your new pattern, it's adorable on the blush pink! Thanks for the peek! I can tell that this will be another MUST stitch. Love your peek. Thanks for sharing. I have the same problem. I also have the John James petites. I will give them a try. I am going to check back for other suggestions. First of all, I am so glad that I am on automatic with Lois for all your designs! As for the stitch tension Alma, I have found that when I "sew" my tension gets like what you are talking about, but if I "stab" I have good tension and equal length of thread ends. I stab even though I am a "in hand" stitcher. This combination may be odd to some stitchers but it works for me and I have been sttiching for 69 years! Sounds to me you may need to change needles. When the thread, no matte if it's one or two threads, starts catching it's because the needle needs to be thrown away. It's seen it's day. I use Piecemakers 26 and I NEVER have a problem. They last a lot longer. This is my 2 cents. Hmmm. I've been doing more quilting than stitching lately, but I'm pretty sure I usually end up with one strand shorter, too. Love all the pretty linens and embroidery! I've been noticing that same problem the past couple of days with my current stitching - but ONLY with 2 shades of green. It's not happening on any of the other threads. I first thought it was a rail-roading issue but it may be a worn needle issue. I too am an Aussie and have no idea what needles I'm currently using, but I wear the gold off them within a week. It will be interesting to find the solution. The new Loose Feathers looks really scrummy, I can't wait for it to come out. 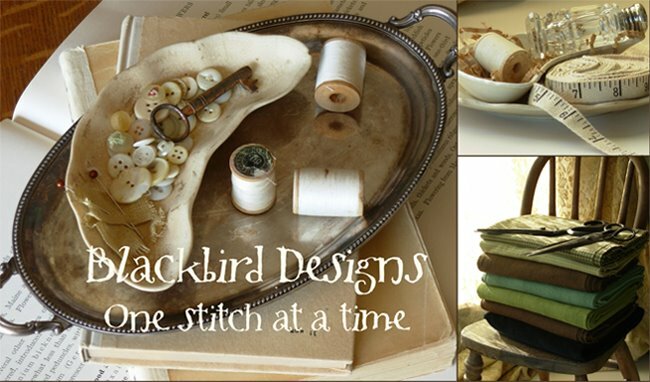 I tend to stitch with one strand of thread, but don't have this trouble when I do use two. I wonder if you knot the two loose ends and anchor them a couple of inches away from where you want to start stitching, that will help with your tension. Or you could try dropping your needle every few stitches and letting the thread untwist, as that is probably causing the problem. This problem plagues me, too, but it seems to be more an issue of the floss I'm using rather than of the needle. I have both JJ and Piecemakers, and always use the shortest possible needle simply because I like them. It usually isn't an issue that really rattles my cage, though. ;) Now floss that 'fluffs' - that's another kettle of fish! LOL. Like Barbara, I have this problem sometimes, but it seems to be the thread, rather than the needle that's the issue, as I don't have it all the time (and I always use Piecemakers #28 needles). I love the sneak peak of the new LF - the colours look wonderful! Hi Alma, thanks for the peek. The new LF is beautiful! I'm stitching the second one and I love the colours. I don't have problem with my threads using the golden needles so I cann't help you. Love, love, love the sneak peak of the new loose feathers! I am with Lily, I only have that problem when I am using the 'sewing' method, particularly if I am on a roll and stitching quickly. If I am 'stabbing' my thread stays even. Hi Alma, I have that problem too. It is more pronounced when I use more threads at one time; for example, the amount of unevenness is much more if I use 6 strands of floss than if I use 2 strands. The unevenness is even greater if I two or more heavy stitching fibers. So over time, I developed the theory that it happens because one or more strands travel farther than the other/s. Look at it this way, you are wrapping two or more strands around a piece of card. The strands are layered on top of each other. The strand on the outside has to travel a slightly farther distance than the one on the inside. It is the same as tracing concentric circles on a piece of paper. The outer rings are longer than the inner ones. By this theory, it is only natural that the strands are going to become uneven as you stitch. This is accentuated by the fact that the threads usually have to go through a relatively small hole between the fabric threads. It is also accentuated by the fact that we like to lay the strands flat. Whether or not this is true, I have no actual proof but I have stopped worrying about it and cut the longer tail periodically as I merrily stitch along. Now if you are still with me, I want to say that I love your pink phase and I love your new project. I have the same problem, too, although until today I didn't know it was a problem. LOL I thought it just "went with the territory". BTW thanks for the sneak peak. I can't wait to see the whole thing! I have the same problem so I am looking forward to the answers you get. And meanwhile only working on projects with one strand! I am in love with the next LF already and can't wait to get mine!! I'm in a real pink place(and a sampler craze) lately too! I used to always have trouble with the threads changing length too (which made me crazy btw!!) I use Piecemakers 28 and stitch two handed and that seems to have made a huge difference. It seems that when I pull in one direction with the left hand, it pulls one way and then in the other direction with the right it corrects the tension. (two handed: I have my stitching in Q-snaps on a floor frame so I don't have to hold my stitching. I keep my dominant hand underneath and my other on top. Works awesome . . . and if I could get my dogs to let me be when I sit in the stitchy chair, I'd probably get more done too. All your work is so nice! The new project looks so pretty. I have been enjoying the color pink a lot lately. It was never a favorite before. I think it's because I have decided to "be a girl again". Life has been moving so fast. This year I celebrated my 50th b-day and I want to enjoy being a girl. Pink is one of my new favorites! Love the colors of the new design. I am not sure what to say about the thread. I do know it absolutely drives me crazy when it happens. I was just having this problem yesterday. I would tend to agree with Barbara & Karen. I was stitching 2 colours in a border and one was a Sampler floss and the other was Weeks. I had more problems with Weeks. I use John James #26. The problem with Weeks isn't so bad that I would quit them but I just noticed it more this time. I'm honoured to be a pink sister. The preview of the new Loose Feathers looks lovely. I stab too and don't have a problem. Maybe one thread is slipping along the fabric as you stitch and the other is not. Make sure both threads are running the same way in the needle. 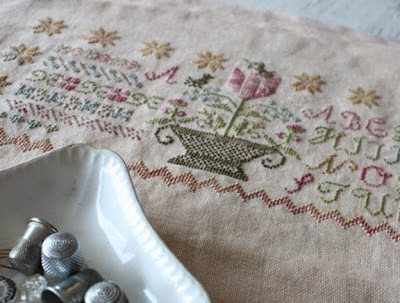 I was thrilled to pieces to see my sampler on your blog! Thanks so much for posting it and for including me in the Pink Sisters! The new LF looks wonderful,can't wait to see it. I too do the stabbing method, but really haven't noticed a problem with my threads. Hope it is working out for you now. I called Barb and had her check template H. She said the template in the book is the size she used. If you want it bigger you could add a bit...but after looking at the picture, I think hers came out pretty well. There is about a 1/2" space between the circle and the finished edge of the piece. You should not have 2 strands. You cut one strand twice as long as you need (maybe 30" long) and thread the two ends thru the eye of the needle. The end will be a loop. Can't wait for the next Loose Feathers to come out! The colors are so pretty. I sometimes have that problem with one thread getting shorter than the other, too. Don't know what causes it. Just a tension problem I think. Please have a look at my"creation"and tell me what you think,like a specialist you are. I have the same problem, I'm wondering if it's the railroading (threads twisting in opposite directions). As for the new LF, 2 words: LOVE IT!! Lovely shots of the freebie stitches too. I don't often have the problem that you described. I mainly use Bohin and Piecemakers needles. I am not sure if that makes a difference. It looks like you have gotten a lot of good advice from others. I just love the new Loose Feathers sneak peek! I will be waiting on pins and needles for it to come out! I sometimes have that same problem, what I have found is that it only does it with certain stitches I am doing, sigh, but I have also found if I drop the needle every few stitches and let it unwind the thread, it works for me, HOWEVER, where in the states can one find John James needles? Doing both cross-stitch and embroidery I would love to find a needle that great. Thank you for the peek, I can not wait for the next LF release. I'll start "La tour Eiffel" tomorow, it's our national day, a way to keep in touch with France even if I am here in the States! LOVE all the pink that will be coming out soon. I LOVE PINK.....mostly soft shades and can't wait TO GET MY HANDS ON THAT NEXT LOOSE FEATHERS PROJECT!! Keep up with the great work designing! HI Alma! Hannah and I just wanted to say "merci, merci!!" for the lovely posting of her picture, your sweet comments, the sneak peek of the next LF and making us "pink sisters"!! Your beautiful handwork, community sharing and your beautiful spirit shine through this blog..which is why it's a daily visit for me! Not sure if someone made already that suggestion or not, I couldn't read all comments. Sorry for that. When I stitch "normal" I always have a bit difference too - no matter what needles I use. The difference in lenghts comes because the 2 threads tangle around each other during stitching and because we repeat our movements, one gets wound around the other and will become shorter. Railroading prevents that. But it slows down your stitching. Personally I only railroad when I use overdyed floss and don't bother if it's solid color. The difference is quite obvious. When I railroad I have no difference in length what so ever. For railroading I don't use any tool AFTER the stitch is done, but I go with my needle between the 2 threads when going down through the fabric. First time I did that I thought that would give a knot, but it doesn't. It simply prevents both threads tangling around each other. I think it's a combination of factors and I agree with many of the comments above. I find it's worse when I'm stitching quickly. I would also suggest that spreading the six strands out a bit to try getting two threads that are lying next to each other helps. In complete agreement with Mainely stitching's comment about thread that 'fluff' being worse though! Beautiful new design - love it! Alma cara anche a me capita la stessa cosa con i threads..non ho mai capito il perchè!! Il tuo nuovo disegno è una FAVOLA non vedo l'ora di vederlo del tutto!! Qui in Italia fa molto caldo..e a me piace il freddo!! The new Loose Feather looks amazing!! I LOVE the colors and can't wait to get it into my stitching hands! LOL I use John James needles whenever possible. I find that I have problems with my floss when I use DMC, which is all that is local to me. I cannot explain the reason other than a better quality. Love the sneak peek of the new LF. Beautiful colors and design. Can't wait to see the complete pattern! I usually use one strand of thread doubled up and looped in the back. So much quicker than working the tail end under other stitches.